The program features custom cocktails made with Hennessy V.S.O.P. Privilège. Giuseppe González is offering the Golden Sazerac, made with Hennessy V.S.O.P. Privilège, Pernod absinthe, Peychaud's bitters and Lyle's Golden syrup, at Suffolk Arms in New York City. Hennessy recently announced a new campaign promoting its V.S.O.P. Privilège Cognac. Titled “Harmony. Mastered from Chaos,” the digital-focused campaign highlights the spirit’s production process and includes a full-length film, an interactive digital experience and other elements. As part of the effort, Hennessy is introducing Cognac Classics Week at 25 bars in New York City and 21 bars in Chicago. The program celebrates traditional Cognac cocktails, such as the Sazerac, French 75 and Sidecar, along with new twists on the classics by leading mixologists. Each cocktail features Hennessy V.S.O.P. Privilège. Cognac Classics Week takes place July 14th through July 21st. A selection of participating venues and specialty cocktails follows. For a full list, click here and here. The Late Late is featuring the Champs-Élysées ($13)—made with Hennessy V.S.O.P. Privilège, Yellow Chartreuse liqueur, lemon juice and sugar—by Sam Ehrenreich. 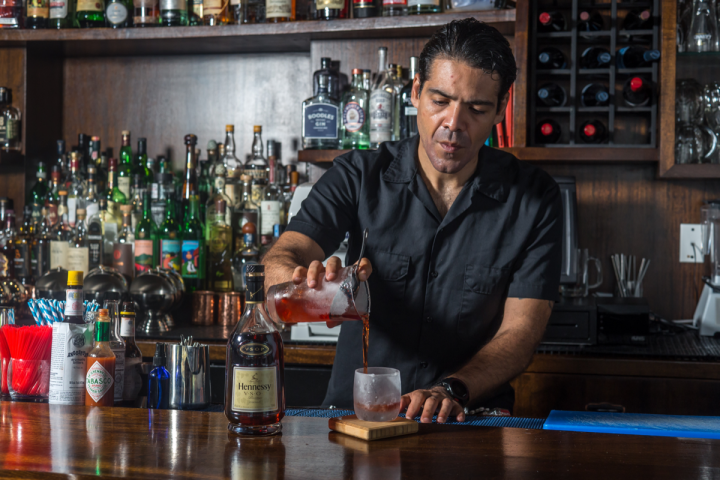 Suffolk Arms owner Giuseppe González created the Golden Sazerac ($14), which blends Hennessy V.S.O.P. Privilège, Pernod absinthe, Peychaud’s bitters and Lyle’s Golden syrup. Sanatorium is offering the Saffron Sazerac ($15)—a mix of Hennessy V.S.O.P. Privilège, Doc Herson’s Green absinthe, Peychaud’s bitters, sugar and Persian Sargol saffron—designed by Chris Norton. Drumbar beverage manager Whitney Morrow created the Cherry Coach Car ($12), which comprises Hennessy V.S.O.P. Privilège, Leopold Bros. Michigan Tart Cherry liqueur, Mandarine Napoléon liqueur, Bar Keep Organic Chinese bitters and fresh-squeezed lemon juice. The Broken Shaker is serving the Salted Pretzel Sazerac ($13) by Scotty Lobianco, made with Hennessy V.S.O.P. Privilège, George Dickel Rye whiskey, house-made salted pretzel syrup and house-made Finch’s Beer Co. Secret Stache stout bitters. Travelle Kitchen + Bar at The Langham is featuring the Sidecar #2 ($15)—comprising Hennessy V.S.O.P. Privilège, fresh-squeezed lemon juice, superfine sugar and house-made tobacco Curaçao—by James Urycki. Virgin Hotel bar manager Jon Harris designed the Japanese ($18), a blend of Hennessy V.S.O.P. Privilège, house-made sesame orgeat and Dr. Adam Elmegirab’s Teapot bitters.